Vietnam’s new tourism ambassador Kong: Skull Island director Jordan Charles Vogt-Roberts has revealed that he's going to make a film to promote Vietnam's landscapes. 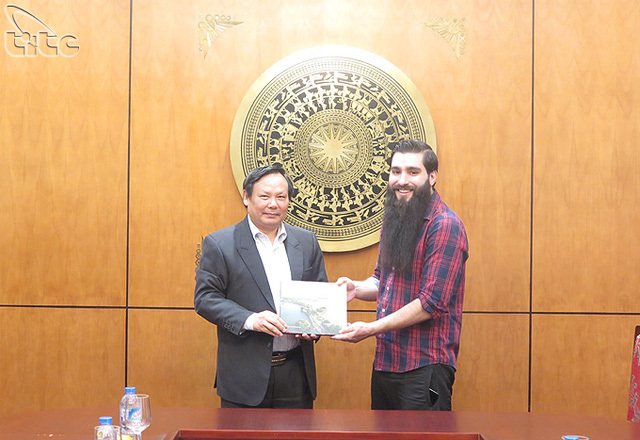 Jordan told the Vietnam National Administration of Tourism about the project and hopes they will support the idea. Vietnam’s new tourism ambassador, Jordan Charles Vogt-Roberts and director of the Vietnam National Administration of Tourism, Nguyen Van Tuan. At the meeting, the young director said that he was very glad to receive support from local authorities when shooting the Kong:Skull Island in Vietnam, especially now seeing Vietnamese audiences are enjoying his film. He also stressed how attractive Vietnam’s landscapes are. "I was right when trying to persuade the producers choose Vietnam not Thailand as the location," he said. Talking about his plans in Vietnam, the new tourism ambassador said that he would call for scholarships for Vietnamese students from the US and some other countries, organise some charity events, and assist local communities to develop tourism industry. Director of the VNAT, Nguyen Van Tuan, said he appreciated the impact the film had on international audiences and their interest in Vietnam. "You've helped sent beautiful images of Vietnam to people world-wide," Tuan said, adding that the VNAT would do its best support the director in his next projects. Tuan also said he wanted the ambassador to attend some tourism promotional events overseas to help attract more visitors.